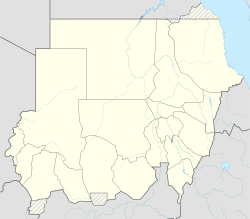 Suakin or Sawakin (Arabic: سواكن‎ Sawákin) is a port city in northeastern Sudan, on the west coast of the Red Sea, it was formerly the region's chief port, but is now secondary to Port Sudan, about 50 kilometres (30 mi) north. Suakin used to be considered the height of medieval luxury on the Red Sea, but the old city built of coral is now in ruins. In 1983 it had a population of 18,030 and the 2009 estimate is 43,337. Ferries run daily from Suakin to Jeddah in Saudi Arabia. Sawakin (سواكن) is Arabic, meaning "dwellers" or "stillnesses." The Beja name for Suakin was U Suk, possibly from the Arabic word suq, meaning market. In Beja, the locative case for this is isukib, whence Suakin might have derived. The spelling on Admiralty charts in the late 19th century was "Sauakin" but in the popular press "Suakim" was predominant. Suakin was likely Ptolemy's Port of Good Hope, Limen Evangelis, which is similarly described as lying on a circular island at the end of a long inlet. Under the Ptolemies and Romans, though, the Red Sea's major port was Berenice to the north. The growth of the Muslim caliphate then shifted trade first to the Hijaz and then the Persian Gulf. The collapse of the Abbasids and growth of Fatimid Egypt changed this and Al-Qusayr and Aydhab became important emporia, trading with India and ferrying African pilgrims to Mecca. Suakin was first mentioned by name in the 10th century by al-Hamdani, who says it was already an ancient town. At that time, Suakin was a small Beja settlement, but it began to expand after the abandonment of the port of Badi to its south. The Crusades and Mongol invasions drove more trade into the region: there are a number of references to Venetian merchants residing at Suakin and Massawa as early as the 14th century. One of Suakin's rulers, Ala al-Din al-Asba'ani, angered the Mamluk sultan Baybars by seizing the goods of merchants who died at sea nearby. In 1264, the governor of Qus and his general Ikhmin Ala al-Din attacked with the support of Aydhab. Al-Asba'ani was forced to flee the city. The continuing enmity between the two towns is testified to by reports that after the destruction of Aydhab by Sultan Barsbay in 1426, the refugees who fled to Suakin instead of Dongola were all slaughtered. The Beja were originally Christian. Despite the town's formal submission to the Mamluks in 1317, O. G. S. Crawford believed that the city remained a center of Christianity into the 13th century. Muslim immigrants such as the Banu Kanz gradually transformed this: ibn Battuta records that in 1332 there was a Muslim "sultan" of Suakin, al-Sharif Zaid ibn-Abi Numayy ibn-'Ajlan, who was the son of a Meccan sharif. Following the region's inheritance laws, he had inherited the local leadership from his Bejan maternal uncles. In 1517, the Ottoman sultan Selim I conquered the port, and after a brief occupation by the Funj, it was thereafter the residence of the pasha of the Ottoman province of Habeş. Under the Turks, Suakin declined sharply, as the Portuguese explorers discovered and perfected the sea route around Africa: when the Ottomans were unable to stop this trade, the local merchants began to abandon the town. Some trade was kept up with the Sultanate of Sennar, but by the 18th and 19th centuries, the Swiss traveler Johann Ludwig Burckhardt found two-thirds of the homes in ruin. The Khedive Isma'il received Suakin from the Ottomans in 1865 and attempted to revitalize it: Egypt built new houses, mills, mosques, hospitals, even a church for immigrant Copts. The British Army was involved at Suakin in 1883–1885 and Lord Kitchener was there in this period leading the Egyptian Army contingent. Suakin was his headquarters and his force survived a lengthy siege there. The Australian colonial forces of Victoria offered their torpedo boat HMVS Childers, and gunboats HMVS Victoria and HMVS Albert, which arrived in Suakin on 19 March 1884 on their delivery voyage from Britain, only to be released as fighting had moved inland. They departed on 23 March, arriving in Melbourne on 25 June 1884. An essentially civilian military force of 770 men from New South Wales, including some of the Naval Brigade, arrived in Suakin in March 1885 and served until mid-May. After the Mahdi's defeat, the British preferred to develop the new Port Sudan rather than engage in the extensive rebuilding and expansion that would be necessary to make Suakin comparable. By 1922, the last of the British had left. On January 17, 2018, as part of a rapprochement with Sudan, Turkey was granted sovereignty over the Suakin peninsula, a once Ottoman possession on the Red Sea. A detailed description of the buildings of Suakin, including measured plans and detailed sketches, can be found in The Coral Buildings of Suakin: Islamic Architecture, Planning, Design and Domestic Arrangements in a Red Sea Port by Jeanne-Pierre Greenlaw, Kegan Paul International, 1995, ISBN 0-7103-0489-7. Turkey will rebuild a ruined Ottoman port city on Sudan's Red Sea. Suakin has a very hot desert climate (Köppen BWh) with brutally hot and humid, though dry, summers and very warm winters. Rainfall is minimal except in November, when easterly winds can give occasional downpours: in November 1965 as much as 445 millimetres (17.5 in) fell, but in the whole year from July 1981 to June 1982 no more than 3 millimetres (0.1 in) was recorded. ^ "Suakin-Gulf of Agig". Ramsar Sites Information Service. Retrieved 25 April 2018. ^ "World Gazeteer". Archived from the original on 19 September 2012. ^ a b c d Berg, Robert: Suakin: Time and Tide Archived 2010-01-13 at the Wayback Machine. Saudi Aramco World. ^ "Facts about Suakim". The South Australian Advertiser (Adelaide, SA : 1858 - 1889). Adelaide, SA: National Library of Australia. 23 April 1885. p. 6. Retrieved 10 January 2015. ^ a b Dahl, Gudrun & al: "Precolonial Beja: A Periphery at the Crossroads." Nordic Journal of African Studies 15(4): 473–498 (2006). ^ "Turkey to Restore Sudanese Red Sea Port and Build Naval Dock". Voice of America. 24 December 2017. ^ "Weatherbase: Historical Weather for Sawakin, Sudan". Weatherbase. 2011. Retrieved on November 24, 2011. Wikimedia Commons has media related to Suakin.